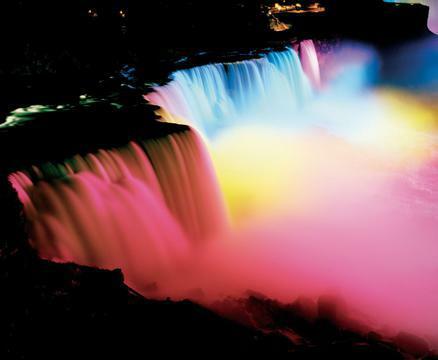 Planning a trip to Niagara Falls, New York is a bit more involved than I originally thought! Obviously, seeing Niagara Falls is the main attraction. You know, is it even possible to visit the town and NOT see the falls? 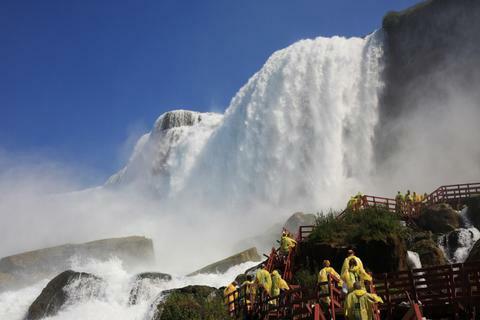 But, after doing a bit of research, I realized families have loads of options at Niagara Falls. And well, since I’ve done all the research already, I thought I’d pass this itinerary on to you! For those flying in to Niagara Falls, I recommend Buffalo Niagara International Airport (BNIA). I like its convenient location and the variety of rental car options. This budget conscious girl appreciates options! With its close proximity to Canada (just across the river, you know), rental car odometers might use kilometers instead of miles per hour — just a heads up! Check into your hotel. For luxury, consider the Giacomo Hotel, which offers stunning views of summer fireworks from the roof. There are a number of hotel chains available as well. Downtown Niagara Falls, New York is quite walkable, so after checking in, enjoy dinner at one of the many restaurants in town. Enjoy breakfast at the hotel if available. If not, enjoy breakfast at a local restaurant. 9 – 11:30 am: Aquarium of Niagara. Located near the waterfront with ample free parking nearby, this attraction suits the elementary and preschool crowd. Kids can get close to the animals. And, you can attend the penguin feeding! Noon: Lunch at The Silo in nearby Lewiston. You may have heard of The Silo on Man vs. Food, in which case you should get the beef on weck. This casual, indoor/outdoor dining on the banks of the Niagara River provides a great place to enjoy a hot dog or burger. Insider tip: Arrive before the lunch rush or plan a late lunch — this place gets crowded in summertime! 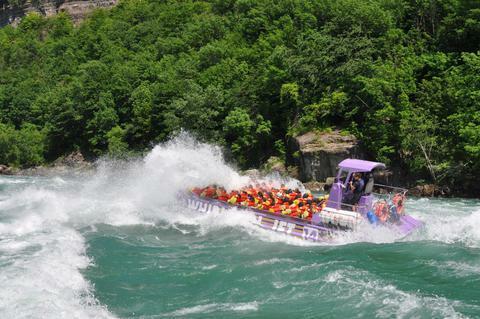 1:00 pm: Take a thrill ride with Whirlpool Jet Boat Tours. This speedy boat tour guarantees guests will get really wet. Ellie was 9 when we visited, and she loved the tour. They provide raincoats and life jackets. We recommend you wear water shoes of some sort (sport sandals with a sturdy strap are good). If you wear flip flops, you’ll be shopping for new shoes after the ride. Leave the camera in the car and purchase the video or photos from the tour company instead. I’d hate for you to lose your camera overboard. 3:00 pm: Depart for Lockport — hopefully in dry clothes — for the Lockport Cave & Underground Boat Ride. Here, you’ll enjoy a different pace — a slow boat tour that takes you through the ruins of the early industrial age. On your way to the boat launch, you’ll walk through underground tunnels to view stalactites, flow stone and other geological formations. Travel Tip: This tour is tough for people who aren’t steady on their feet. The walkway is old and uneven, and the ground can be slippery. We recommend it for people who are steady on their feet and for kids ages 4+. Younger kids might not like the cold, dark, damp environment. 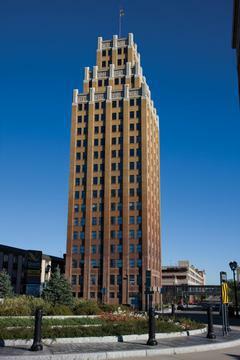 6:00 pm: Head back to Niagara Falls for dinner at Savor, of the Niagara Falls Culinary Institute. This was the highlight of Ellie’s vacation! She loved being treated like an adult and “savored” every bite set before her! Dinner at Savor is a slow-paced experience, but it’s family friendly — and a great way to unwind after a busy day. Return to hotel for the evening and collapse! Or, head up the Giacomo bar on the top floor for great views of the area. Rise and shine for another exciting day! This time, it’s all about the falls. We stayed at the Giacomo when we visited, which is in walking distance of Niagara Falls State Park. Within the park, a trolley system (ticket purchase required) makes getting from place to place very easy. Ellie thought the trolley was fun, too. 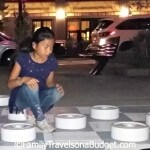 Save money with a Niagara Falls USA Discovery Pass. 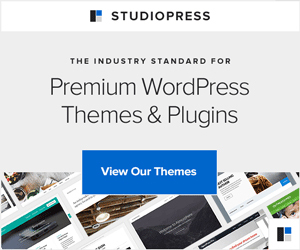 Click here for current rates. 9:00 am: Tour Cave of the Winds and then Maid of the Mist, both part of Niagara Falls State Park. 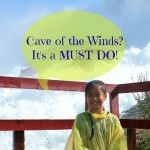 Cave of the Winds gets you really close to the falls — and you will get wet! Admission includes special “Cave of the Winds” sandals and a water poncho, but they won’t keep you too dry. The attraction is slightly misnamed, because you don’t go into the “cave” but see it from the wooden scaffolding out front. It’s windy and wet. Ellie absolutely loved experiencing the power of the falls and the wind the water generates. We laughed so much. Maid of the Mist, the famous boat ride, provides a slow ride to the base of the falls. Along the way, the guide points out different things (though it’s hard to hear). Like Cave of the Winds, ponchos are provided, but you’ll still get wet. If you take a camera, we recommend a waterproof case with a good strap! Noon: Lunch at Top of the Falls, Goat Island, Niagara Falls State Park. This restaurant serves trendy burgers and hot dogs in a casual atmosphere with some of the best views in the world. The restaurant is air-conditioned, so bring a sweatshirt or sweater, especially if your clothes are still wet. Afternoon: Hike Devil’s Hole at Whirlpool State Park, which is nearby. The upper level offers great views. The lower level lets you get close to the roaring waves for fishing. 5:00 p.m.: Return to the hotel to get ready for dinner at The Red Coach Inn. This charming restaurant in a historic tudor inn offers a different, award-winning menu every day. The restaurant welcomes kids — making it a comfortable place to enjoy a fine dinner even with kids in tow. Our server even sang Disney songs with Ellie. She loved it. Head back to the hotel to get a good night’s sleep and pack for home. Enjoy breakfast at the hotel and checkout. I did this trip and loved it! This so makes me want to go back again! I’ve only been to the Canadian side as well, but I can strongly encourage people to explore the surrounding area as well – Niagara-on-the-Lake and the Niagara Escarpment have a great arts scene and are home to some amazing wineries. Also, I have a system as well – I spend the first week leading up to my trip reading about the destination. On the ground I manage many tasks- note taking, photos, social media sharing, some photo editing (from phone, the camera shots are edited post trip). In my room I’m backing up data, checking emails, making deadlines and sometimes holding a meeting. At home I’m editing film and stills, then when the film is done I let myself get inspired. My writing process takes a minimum of 2 weeks post departure. I’ve been to Niagara Fall twice as a kid (once I remember) and it was where my parents went on their honeymoon. We did the Maid of the Mist but mainly stayed on the Canadian side as I think the views are a bit better from there if I remember correctly? Sounds like a fun itinerary, great that you get to take your daughter along. I’ve visited Niagara Falls several times. Once, my husband and I stayed on the Canadian side overlooking the falls for our anniversary. We had an amazing time with a view of the falls from our room. It was gorgeous. 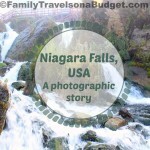 Our family trip was on the US side when we did many of the tourist attractions right at the falls. 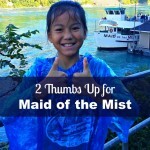 We loved the Maid of the Mist boat ride and Cave of the Winds (you will get soaked). Would love to have gone on the Lockport tour. Sounds like you’ll have a great time. Enjoy! I’ve only been to the Canadian side, but I hear the Maid of the Mist only runs from the American side now. Do you know if that’s the case?